Whether you're looking for a quiet place with a gorgeous view to sit and read, or want to learn more about the ports you're visiting on your Holland America cruise, Explorations Central at the Crow's Nest is your go-to spot. Launched first on Westerdam in July 2017, the line is rolling out the destination experience center to seven more ships by the end of 2018. Located in the Crow's Nest, Holland America's popular forward observation lounge, Explorations Central is a multi-faceted education center -- think of it as a destination's visitor center, except located on a ship and with information about multiple places instead of just one. It's a gorgeous spot, with nearly 300 degrees of floor-to-ceiling windows for phenomenal views; comfortable furnishings in neutral shades of tans, sky blue, browns and rusty orange; and a small circular cafe counter with specialty coffees and free pastries. It's popular with readers, puzzle aficionados and card players. But it's not just a place for passive relaxation. There's an EXC desk for cruisers to book tours or get help planning self-directed tours; EXC guides are more than happy to spread a map out and sketch out a rough itinerary with you. Explorations Central also has touch tables with information about most of the ports on the ship's current itinerary and there's a small library with informational and photography books themed around maritime history and yet more information about ports. 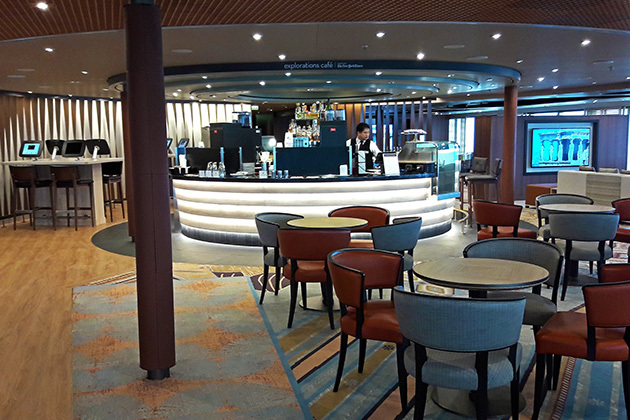 On the port side of the lounge is a presentation space where basic language lessons are offered or lectures given on topics like Mediterranean herbs and spices, tapas or the myth of the Pillars of Hercules in Spain. Cruisers can share their opinions with the interactive Question of the Day station, which asks a daily travel-themed question for people to answer. Examples are which country could you visit over and over again? Or which destination surprised you the most? 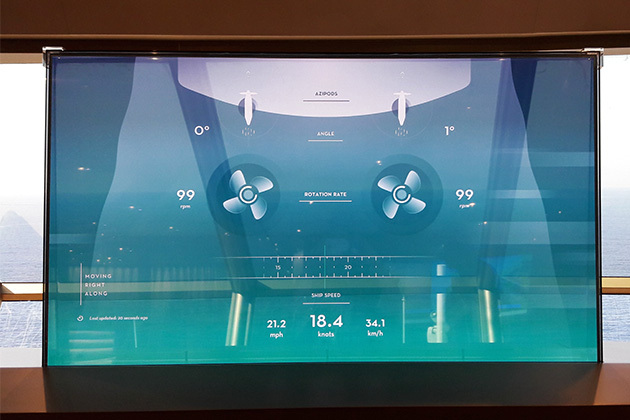 Ship geeks will like the digital displays that mimic what the captain sees on the bridge -- azipod status, propeller rotation rates, speed, ocean depth, etc. It's free, though drinks at the Explorations Cafe will cost extra.